Thanks for making this theme. I love it. It is the best I’ve come across so far. This will be my new default theme! I must agree, it is perfect! However, I realized that the theme is set only for Java language… :/ Would it be possible to set it as default so it is applied to all languages (like PHP)? wait after i download it how do i apply it to the ide? Nice theme. What font is used in this particular screenshot please? Is there a light theme? @Tomas Mysik: You could try doing it yourself by going to options -> fonts & colors. @Kenny: That would be Consolas. @Vikrant: In VS? Yes. But I’m not aware of a Netbeans one. cewl, thanks, hope it supports debugging and highlighting well. thanks. 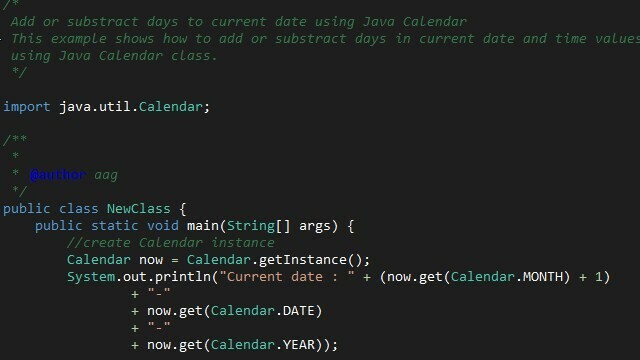 Hello, thanks for the theme, I use Visual Studio 2012, so I think I’ll love the theme. But, how do i install the theme. I’m new to netbeans. The “add plugins” window seems to be looking for a (*.nbm) file. Thank you so much. I just love it! Dude, i love you! thank you very very much!! This is life saver theme for .NET devs.. Thank you!